It's hard to get more up close and personal than this – but how does one go about capturing such spectacular photographs? Screenshots captured from "Car-L meets the lions". 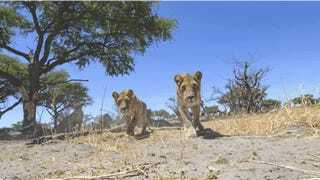 The answer: by strapping a DSLR inside a heavy duty, radio-controlled camera buggy and driving it right up next to a pride of very curious lions. This was the enterprising approach taken by travel photographer Chris McLennan on a recent shoot in Botswana. He calls his 4x4 camera creation (which was engineered by Carl Hansen) "Car-L." The incredible photoshoot is documented in McLennan's short video "Car-L meets the lions." McLennan's creation managed to safely photograph a lion, but may have sparked more curiosity in the lionesses than he bargained for. Still, he says Car-L "survived his injuries and is ready for his next adventure." We can't wait to see what he photographs next. Check out more of McLennan's innovative work on his website.